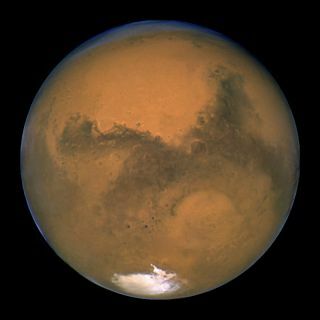 Image of Mars captured by NASA’s Hubble Space Telescope in 2003. If you're looking for an out-of-this-world gift for Mother's Day this year, you could always name a Martian crater for Mom. The space-funding company Uwingu, which sells naming rights to each of the nearly 600,000 identified Mars craters that don't already have a moniker, is offering a special deal: Name a crater from now through Sunday (May 10), and you get a Mother's Day certificate. The stated chief goal of Uwingu (whose name means "sky" in Swahili) is to raise money for space research while also getting people excited about space exploration. Half of all proceeds generated by selling Mars crater naming rights will therefore go to fund grants in space science and education, company representatives said. The crowdsourced crater names will not be "official" ones recognized by the International Astronomical Union. But the appellations will help fill out Uwingu's "people's map of Mars," which will fly to the Red Planet aboard the Mars One colonization effort's first robotic lander. That mission is currently scheduled to launch in 2020. Uwingu started the Mars crater-naming project back in February 2013. Since then, people from around the world have given appellations to more than 16,000 Red Planet craters. "People love this — it's so unique," said Uwingu CEO Alan Stern, who's also principal investigator of NASA's New Horizons mission, which will fly by Pluto on July 14. "People write us on Facebook, and they tweet to us — things like, 'We look at your Mars map, and it's so humanizing,'" Stern told Space.com. "There are all these names of people, and there are the stories behind them. When you name something, you get to dedicate it, and people tell stories." Uwingu's Ellen Butler, who works in marketing with the company, said she bought a crater name for her mom in 2014 and plans to do so again this year. "It's kind of a feel-good gift all around," Butler told Space.com. "The person who's giving it can feel good about giving something unique and memorable and thoughtful to someone they love. And as part of this, they're also helping fund new projects in space research and education."